Great turnout design! 100 hrs, heh? Thanks. Would like to know more about the Sliding Rail Chairs and those neat little what-ever-they-ares between the points. What is the pivot mechanism under the sliding points? I've pulled up one of the switch handthrow mechanisms but the wires going down through the extruded foam subbase of the module weren't long enough for me to fully extract the DPDT switch. nevertheless, i think the photos and description should be enough for you to see how these things are put together. Henry was asking about the sliding rail chair thingies. Well, on real railways ... at least in my neck of the woods ... the point rails that switch from side to side would not last long if they were allowed to slide from side to side and would destroy the ties under them or get caught up on the timber in short time. So, to overcome this problem and to ensure that the point (switch) rails can move freely (slide) without catching on anything as they do so, placed what is known as "sliding rail chairs" under the point rails to support the rails on metal. These sliding rail chairs are long enough to make sure that the point rails are fully supported and extend under the mating stock rails to support them as well. Also, this extension under the stock rails provides a means to fix the chairs to the stock rails (usually bolted) and to the wood ties. In the instance that i am modelling (Puffing Billy in Oz) the extensions under the stock rails have a cylindrical cast iron and drilled block outboard of the stock rails through which a bolt is inserted and bolted to the inside of the stock rail at that location. The model photos should be explanatory. There are no commercial parts available that i could find to represent these sliding rail chairs that looked like Puffing Billy's 30"gauge chairs so i modelled these by scratchbuilding them from styrene strip and rod and added Grandt Line NBW's where appropriate. To add rail chairs, the ties under the chairs have to be thinner than the other surrounding (normal) ties so that the rail height is the same through the turnout (obvious). I make my own ties from balsa so that i can get strong grain effects wire brushed into them and so for On30 am using 3.2mm wood for the normal ties and 2.4mm thick timber for the ties under the chairs. The chair supports are therefore 0.8mm (0.030") thick where they go under the stock and point rails. This is built up using 0.010" and 0.020" Evergreen strips. The other thing you guys asked about are the white thingies between the point rails. These are rail spreaders and their task is to hold the point rails at the proper distance apart, to make sure that both point rails move (slide) at the same time and to ensure that the wheel flangeway at the tip of the points is maintained. They are usually made from bar or rod steel and are bolted to connector blocks attached to the point rails. 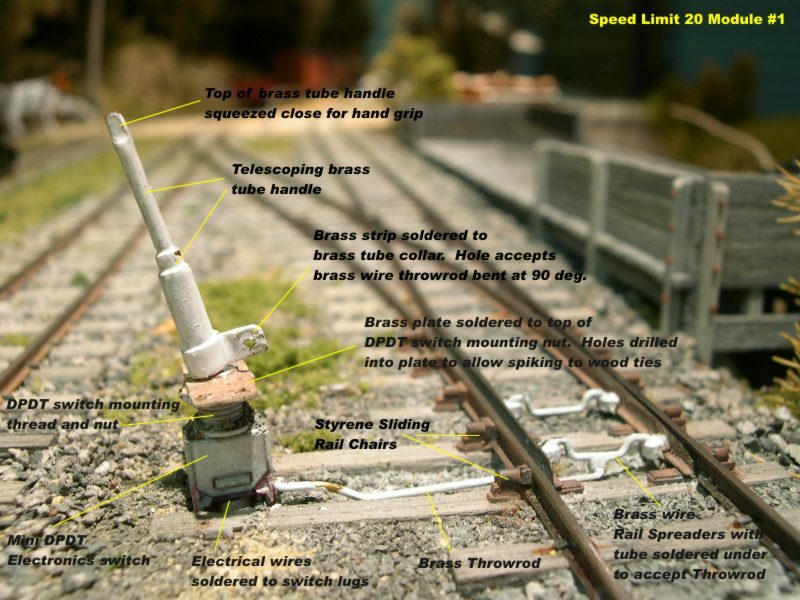 We don't seem to model these spreaders on our model turnouts, but handlaying track give the perfect opportunity to add this detail and to make sure that the point rails are kept in gauge just like the prototype. The other thing is that on commercial turnouts and models, we seem to use fat wood ties as the throwbar and this doesn't seem very prototypic to me. So the decision was made to have a go at modelling the Puffing Billy (... insert your favourite prototpe railroad name here ...) practices for the spreaders. I simpy made these from 0.015" brass rod bent to shape as per the prototype. I made some small styrene blocks to represent the connecting plates for the spreaders and obviously to circumvent electrical shorts across the point rails. I drilled a small hole in each block and bent the spreader bars to push down into these holes. No glue needed and they work perfectly. And they are easy to make. The first rail spreader attaches to the throwbar to transfer the throw from the DPDT toggle to the point rails. I soldered a very short length of 1mm dia. brass tube to the underside of this first point rail spreader at right angles to the throwbar. The throwbar bent to shape from 0.015" dia brass wire to fit between this spreader tube piece and the collar around the throw lever. Both ends of this throwbar are then bent at 90 degrees to fit into the hole at the throw lever one end and the brass tube piece under the rail spreader at the other end. Paint holds them in place and you can probably see from the photos that i've scratched off some paint in the process of removing the throwbar to extract the DPDT switch from it's hole in the subbase. These switch mechs work very well in both holding the point rails over to their mating stock rails (all due to the dpdt's internal spring loading) and switching power to the isolated frog area. I apologize to the RR-L forum administraors that these two pictures are larger than the requested limit but you wouldn't be able to read the captions in the photo if i made them any smaller. The photo below is a pretty rough closeup of the frog area built up using code 100 rail in a jig made for the purpose. All good fun. Wow Rick, what a great pictorial/tutorial. Tnx very much. I know that took some time to put your post together. Looks like a candidate for the archive to me. No problem, Rick. This is an excellent tutorial that should be of benefit to anyone who reads it. That's all the justification that is needed! Jim said in an earlier post that he was about to start on a new On30 mini layout. As such, he might be more interested in my Autocad design for a #4 turnout rather than the #5 i posted earlier. Hope this helps in your planning, Jim. Sometimes we meet a person, and think yep , he's a nice guys, then I see some of the stuff Rick from downtown Sydney ( hours drive south )and think "Shivers", he knows a bit. Rick your pics on the various threads are great and you spend alotta time writing text. I was hoping to catch up with Geoff Nott soon, so I might detour to your part of the country for the night. Great bunch of people in this "worlds best past time". PS..... also must catch up with Barry Pate.... he has finished all the manual labour on his Aussie shed. Thanks for the tutorial. One more question remains for me. You mention hinges on the "True Length" PDF. How do you hinge the tapered points? We have been using code 70 and 83 rail and found that we did not need any form of hinge. The rail was flexible enough. However, having said that, Your switches are quite desireable. Tnx for the #4 turnout info, Rick. You must have been reading my mind. I tried to set up my track plan with #5 turnouts and was having a hard time getting it all to fit. Tried #4's and it all fit good. All my engines and rolling stock are going to be fairly short so should work fine. No problems about the "tutorial" ... i did not expect to give one but to merely share my experiences after trying to come up with a simple, workable solution for a cheap and reliable working groundthrow that somewhat resembles the prototype i use as a modelling basis. And most importantly to give back to the hobby for all the efforts and friendships that others have shared with me. It's all good fun. About the hinge point of the point / closure rail joint, i found it necessary to make a definite hinge point in the code 100 rails simply because of the bulk of the metal. 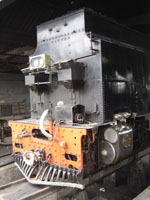 Puffing Billy uses 60lb/yard rail weight and in O scale this comes out about code 92; halfway between codes 83 and 100. As code 100 rail is cheap and readily available here in the form of Peco HO scale flex track, i decided to go with that and strip the rails fom the plastic sleepers. While slightly larger than i'd prefer to us, by the time its spray painted (before being spiked down) it looks ok to me and i'm happy enough with it. I was using code 70 rail previously when testing out the cadd plans and building test turnouts and in this case, i agree with you ... there is no real need to cut a hinge point as the lighter rail size flexes quite nicely as it is. Even so, i cut the railhead and bottom flange with a saw so that only the rail web was left to allow even better flexing. This didn't work too well with the code 100 rail though. I found a couple of old poor quality photos of one of my experimental turnouts, and while they are terrible photos, i've added them below for the sake of the discussion. You'll see on the far left hand side of the first image the 0.005" thick shim brass strip that i soldered across the inside of the rail webs for the hinging point. It flexes good and allows electrical conductivity to the point rails. Once painted i think they look a lot better (imho) than bulky rail joiners. I've also posted another old photo that shows the electrical switch and components made for the test turnout. This has been since refined a bit better but is the basis of what i ended up doing on the actual layout module. While i have been saying all along that i used mini DPDT electronics toggle switches, there is no reason why you couldn't use SPDT toggle switches either to route power to the frog. I just happened to have the DPDT's around when i built the real turnouts. Tnxs again Rick for all the great info. I would really like to try my hand at handlaying and this is really going to help. By the way your tie work looks great. Topper tape for roadbed and caulk for attaching the track to the roadbed. 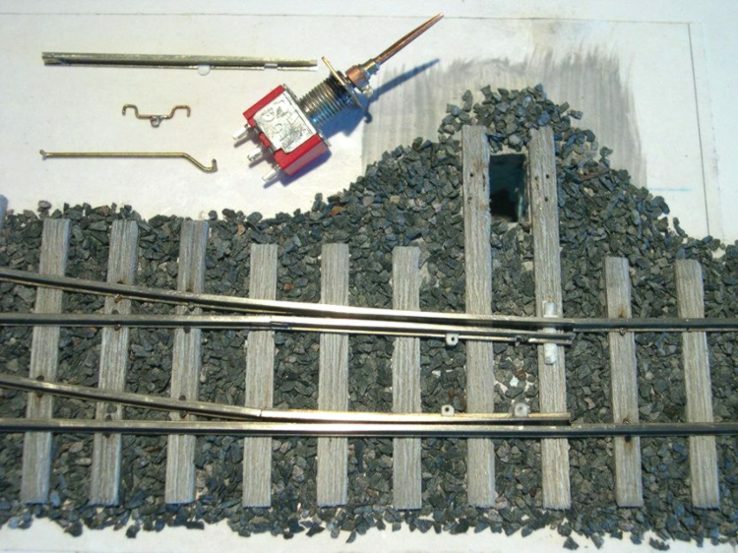 I read an article by Chuck Hitchcock titled Quick and Easy Flextrack in the August 2003 issue of Model Railroader. Since I was about to put down my first ever track for my Mini layout I decided to give this method a try. The roadbed is topper tape which I was able to purchase locally at an automotive supply store. Chuck mentions that it comes in wide variety of widths and thicknesses. I was only able to find one size which is 1 1/4 inches wide. The thickness is approximately 1 1/2 scale feet in HO. The cost for a length of 360 real world inches(10 yards) was $10.00. I do not know how this compares in cost to other products used for roadbed. The product is made of vinal foam and is used to insulate pickup truck caps. The only tools needed for the project are the tape, some caulk a putty knife to spread the caulk and something to cut the tape with. I used a single edged razer blade. The tape is only sticky on one side and this is the side you apply to the subroadbed or whatever you are using to lay the track on. The top of the tape has a protective skin that you peel off and if you are applying the tape in a straight line you remove the protective film after putting down the tape. Since I am not laying a main line I have placed the tape directly on the foam base. The tape sticks very well and is almost impossible to remove in one piece if you put it in the wrong place. So make sure you have the tape where you want it before installing it. If you are putting the tape down on a curve you must remove the protective skin first and then the tape can be put down on a curve. It is important not to stretch the tape when placing it on a curve as this will affect the thickness. I then applied a thin bead of caulk to the top of the tape and spread it with a putty knife. You do not need a lot of caulk and if it starts to ooze up between the ties you are using too much. The caulk remains workable for 15 to 20 minutes which gives you plenty of time to make adjustments in the track. You only need hand pressure to set the track into the caulk. Another advantage of the caulk is that you can remove the track from the foam long after the caulk has hardened with little damage to the track. This method will not work for anyone who wants the spite down the track as the foam tape is not rigid enough. Since this is the first track I have ever put down I have no way to compare the method or cost to other methods. Chuck does mention that he has had his track down for over a year will no problems. Modeling the Alaska Railroad in HO in Wildwood Georgia. The Woodland Scenics foam bed I'm using is about $8 for 24 feet. So it's comparable to this stuff. I like the WS for a couple of reasons. One is the roadbed is readily split in half. So I am pinning down one half of the roadbed to check alignment and placement first. Then I glue the other half while snugging it against the pinned half. After I pin down the glued half, I go back and glue down the first half. 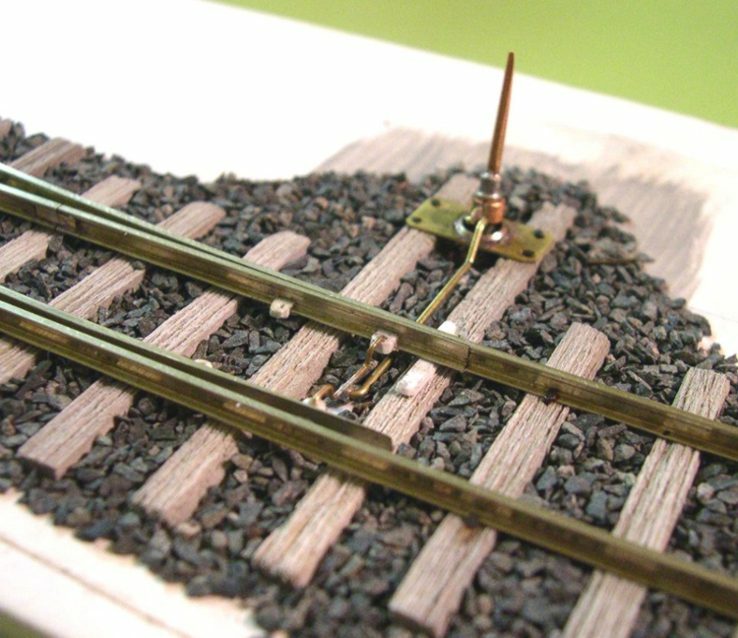 Two is the roadbed is easily cut and pieced together for irregular places like turnouts and crossings. 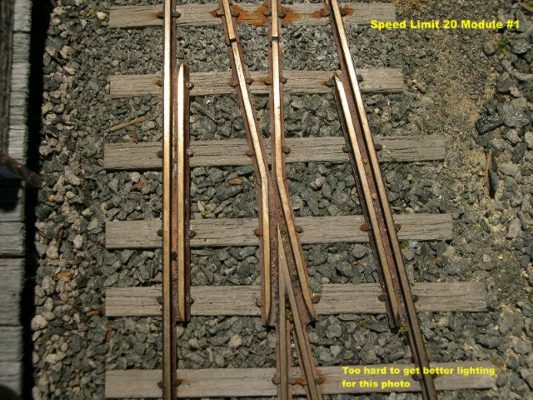 My construction thread with pics is at http://www.railroad-line.com/forum/topic.asp?TOPIC_ID=8009 . Anyways, John, your trackwork is looking good. Thanks for posting the informative alternative. 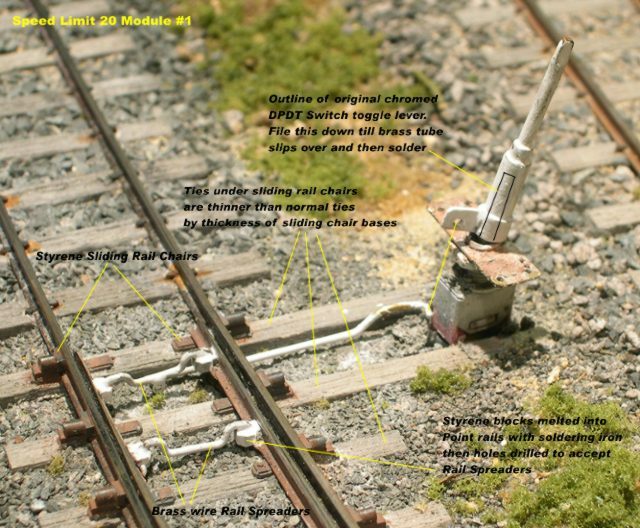 Here is a link to a thread on Faux Ballast. This was originally posted by Karl Scribner. Just a couple of things regarding track and roadbed. 1. On my previous layout, I used the Woodland Scenics risers and roadbed and they worked just great. 2. I used Woodland N scale roadbed on the current layout as described by Bill Darnaby in one of his articles on building the Maumee Route. But I did use adhesive caulk as recommended by Chuck Hitchcock. It's pretty versatile stuff. I now keep a tube on the workbench as well and use it for a vaiety of gluing tasks. Since this was a new technique for me, I did a little test section on a piece of scrap foam. And, yes, most of the track will be weed covered; that's why I don't handlay track anymore. The difference between N scale and HO scale roadbed. I used HO on the mainline and N on the short line because of the lower profile. Turnout pads were easy to make using WS sheet foam bed. I just put the turnout on the sheet and cut around it. Done! The next step was to lay down a bead of adhesive caulk. You don't need a lot, as I discovered, the stuff is really tacky. A simple putty knife spreads the caulk along and to the sides of the track centerlines. As David pointed out, the foam bed is easily splittable using a standar hobby knife. Then I simply pressed the foam bed into the caulk and held it in place with WS Track Pins (another great multi-task item). Then I pressed the other section in place and held it with the track pins. OK Here's the finished section ready for track. I also used the adhesive caulk to secure the track. It holds well, but if I need to change something, I can easily pop off the track. Here's a shot of the roadbed at Louisville. That gap in the track is the site of Boggy Gut Creek, and yes, Virginia, there really is a Boggy Gut Creek and trestle on the real L&W. That's about it. However, through all of this, there's one track laying technique I have never been able to master and keep the trains from derailing. Maybe you guys can help . . .
OK, maybe some things are better left unmodeled! You have placed this in the correct place. I agree on the caulk as I used it with the topper tape and really like how it holds the track in place but not so permanently that it cannot be moved or replaced. I think for my next track I will also go with the Woodland Scenics roadbed. As for the last picture that looks just like the track I finished laying.